We begin our tour of the user interface with the lockscreen. By default, it has four shortcuts and a ring at the bottom. You drag the ring towards the center of the screen to unlock the phone or drag any of the shortcuts into the ring to unlock the phone and launch the corresponding app. You can assign any four apps to the lockscreen that you like. 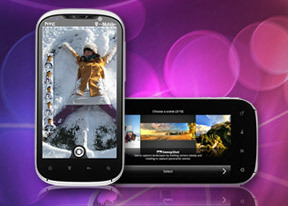 That’s not the end of it - the HTC Amaze 4G comes with six different lockscreens preinstalled. You can access the others from the Personalize menu. The default homescreen just shows the ring, four shortcuts, the time and the homescreen wallpaper. Then there's the Photo album lockscreen, which tosses photos from your gallery in cool 3D. There's the Friend Stream widget which shows SNS updates from your friends and the Weather widget, which shows off the Sense UI's cool weather animations. There's Stocks too - with quotes flying up or down, again, in eye-pleasing 3D. Finally, there's the Clock lockscreen which shows a bigger clock - you can pick any of the 11 clock widgets you have. Going further than the lockscreen reveals the Sense homescreen. There, we meet a scroll arc at the bottom that is just an indication of which homescreen pane you’re on – it can't be used for actual scrolling. There’s Leap view instead - tap the home key (while on the center homescreen) or do a pinch gesture to zoom out to display the thumbnails of all seven homescreen panes at once. Upon a press and hold you can drag to reposition the homescreen panes as well. Seven homescreen panes are all you get – there’s no add or delete option – it will come with Sense 3.5. With all those widgets (which are quite useful too) you’ll want to keep all of them anyway. HTC Sense comes with HTC proprietary Scenes – essentially six custom homescreen setups (Work, Travel, Social, etc). Each scene changes the wallpaper and the set of widgets. For instance, the Work scene has a Stocks widget, while the Social offers a Twitter widget. Those can be customized, of course. You select a Scene within a fancy-looking 3D card interface. You can modify existing scenes (older Sense versions prompted you to save modifications as a new scene) and you can get more scenes off the HTC Hub. Switching between scenes takes a couple of seconds but the customization goes deep – the business and personal modes that some competing phones offer seem quite limited compared to the HTC Scenes. The HTC Sense has another customization option called Skins. Every skin changes the look and feel of most of the onscreen buttons, application screens, option menus, and other items. They also come with unique wallpaper and use different colors for various UI elements. They can also replace the standard dock, lockscreen and widget frames with custom ones or change their shape. The main menu has the typical grid layout, which is composed of vertical pages with shortcuts sorted alphabetically. You can set different sorting options - alphabetically, most recent or oldest - but you can't rearrange them manually. There's a list layout, where two-finger alphabet scrolling is enabled. The main menu has a tabbed layout similar to different Sense elements (such as the phonebook). There are three tabs available at the bottom – All apps, Frequent and Favorites. They are quite useful especially when you have lots of installed applications. Tapping the Personalize button brings out a whole screen of items to choose from – for the display (scenes, wallpapers and skin), for the homescreen (widgets, shortcuts, folders, etc.) and even sounds (ringtones, alarms, notifications and Sound set). In the widget section, both types of widgets (custom HTC and stock Android) are placed on the same page. There are so many of them you may find the seven homescreen panes short. You can download new widgets off the Market or the HTC Hub. When you select a widget, you are prompted to choose between several versions – most widgets have at least two styles. The different versions typically offer at least two sizes of the widget and different skins. For example, there are seventeen different clocks. Some widget styles even offer different functionality. One version of the Twitter widget, for instance, shows updates for the people you follow and lets you tweet/update status. The other version is more compact and only allows status updates and tweets. Editing the homescreen is different from vanilla Android. You can tap and hold on a widget and you can drag across homescreen panes. While you're dragging a widget (or shortcut or whatever), two "buttons" appear at the bottom of the screen - Edit and Remove. You drop the widget on either button to perform the corresponding action. The notification area features a list of recent apps (in addition to the notification list), just like a task switcher. A press and hold of the Home button works too. The notification area is tabbed too - the second tab has toggles for WLAN, Bluetooth, GPS, cellular data or the Wi-Fi hotspot. There is a shortcut to the full list of settings and the last line shows used/free memory. Besides the standard task switcher, you get a task manager too. It's simple to use - each running app is listed with an indication of how much RAM it's using (no CPU usage reading though). You can terminate apps one by one and there's a Kill All button too. We are fresh off testing the Snapdragon S3 chipset’s performance from the HTC Amaze 4G’s counterpart – the T-Mobile Samsung Galaxy S II, and we found it to be no slouch. In the case of the subject of our review, the 1.5GHz dual-core Scorpion CPUs performed in a similar fashion, except for the Quadrant and Antutu benchmarks. The Amaze 4G scored lower on them, most likely due to its higher screen resolution. See the benchmarks below. Interestingly enough, the HTC Amaze 4G got the highest score we’ve seen to date on the Vellamo browser benchmark. It handily beat all Samsung Galaxy S II versions by some margin. We all know by now that benchmarks are mostly reserved for bragging rights. That said, we found the HTC Amaze 4G to be quite zippy and lag free when handling its daily tasks. One would have to be seriously picky to complain about the device’s speed.